Still keeping an eye out for the best deals after the Holidays! 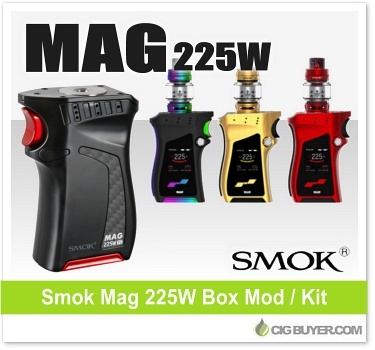 Here’s a great one on the Smok Mag 225W Box Mod / Kit – only $59.99 at US vendor Ejuice Connect. The Smok Mag Mod has a unique and ergonomic design with a trigger-style firing button and an an innovative lock and load ejecting battery door. Powered by dual 18650 batteries, it incorporates Smok’s latest chipset with an intuitive and highly customizable color OLED display, providing up to 225W of output and supports SS (304 / 316 / 317), Titanium, Ni200 and TCR.